In the wake of the withdrawal of commercial journalism from local communities at the beginning of the 21st century, Hyperlocal Journalism critically explores the development of citizen-led community news operations. 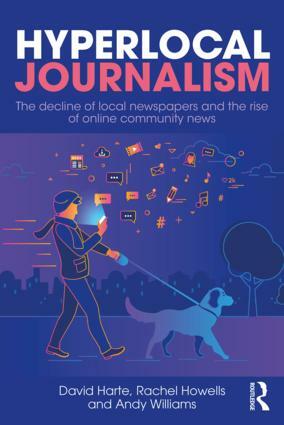 The book draws together a wide range of original research by way of case studies, interviews, and industry and policy analysis, to give a complete view of what is happening to communities as their local newspapers close or go into decline to be replaced by emerging forms of digital news provision. This study takes the United Kingdom as its focus but its findings speak to common issues found in local media systems in other Western democracies. The authors investigate who is producing hyperlocal news and why, as well as production practices, models of community and participatory journalism, and the economics of hyperlocal operations. Looking holistically at hyperlocal news, Hyperlocal Journalism paints a vivid picture of citizens creating their own news services via social media and on free blogging platforms to hold power to account, redress negative reputational geographies, and to tell everyday stories of community life. The book also raises key questions about the sustainability of such endeavours in the face of optimism from commentators and policy-makers. David Harte is Associate Professor in Journalism and Media Studies at Birmingham City University, UK. Within the Birmingham School of Media he teaches on modules related to journalism studies, social media, and alternative and community media. He supervises PhDs in the areas of journalism and community media. He has also published on the role of social media in media education and worked on creative economy initiatives within the West Midlands. Rachel Howells is a journalist and media researcher. She has worked as a journalist for almost 20 years and was a founding director of the hyperlocal news co-operative Port Talbot Magnet and editor of its newspaper and website. Her research is focused on the decline of local newspaper journalism in Wales and the effects of this decline both on the production of news and local citizens. She sits on the National Union of Journalists' Welsh Executive Council and on the advisory board of the Independent Community News Network (ICNN). Andy Williams is Senior Lecturer at the School of Journalism, Media and Cultural Studies at Cardiff University, UK. He has a number of research interests which intersect journalism studies and cultural studies, including the practice and political economy of local journalism, and the relationship between news and public relations. He is a founder member of Cardiff University’s Centre for Community Journalism.